From simple business presence to full-featured e-commerce websites. We are a full-service website design & development firm. We have made a name for ourselves by delivering high-quality work to our clients. Using the WordPress content management system and Magento ecommerce platform, we’ve built websites for start-ups and established clients alike. Since 1999, we have been developing ecommerce and non-ecommerce websites for businesses and individuals in the Finger Lakes region of New York state. We offer development services, including responsive, mobile-friendly website design, website marketing and maintenance, that will quickly put you on the Internet. We understand that every business is unique so we will work to understand what you do, who your customers are, and what makes your business successful. We will then work together to create a website that will increase business and generate revenue. JRH Web Design & Hosting is committed to providing excellent, ongoing service to help your business grow. We want to be your partner and are prepared to prove it day after day. Get a FREE, no-obligation quote for any of our services. Learn how we can help you establish or improve your web presence which will expand your client base and extend your marketing reach. 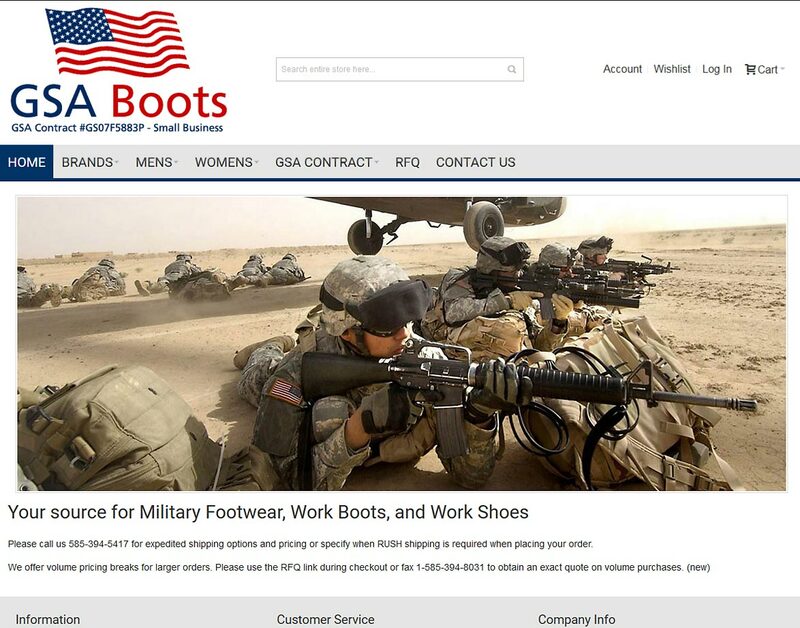 The GSA Boots website is an ecommerce website with a responsive, mobile-friendly design that is targeted to GSA government customers. It features a clean, modern design that maximizes customer convenience with a streamlined ordering process. The website, owned by Davidson Shoes of Canandaigua, NY, in combination with their retail footwear website, has dramatically increase annual sales for this brick and mortar retailer. JRH Web Design and Hosting is a business providing Web site design, marketing and hosting to businesses and individuals through out the Finger Lakes region of New York State including the cities of Geneva, Waterloo, Seneca Falls, Canandaigua, Newark, and Ithaca. In addition to Web site design and hosting, we also provide search engine marketing (promotion) services for new or existing Web sites. We are located in Seneca Falls, NY half way between Rochester, NY and Syracuse, NY.